Some months ago, my neighbor showed me this quilt that came from her mother in law's home last year. She has no idea who made it, nor when; another reason it's important for us to put signatures and dates on our work. I was fascinated by the block design. I have photographed it today in hope that one of you may recognize it. My other hope is that perhaps one of you may be skilled at dating based on prints. 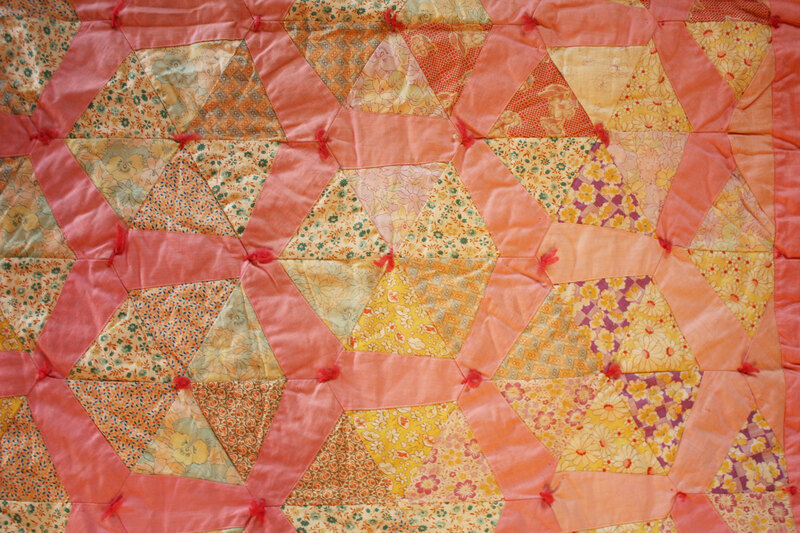 The quilt is tied, and was sewn on a machine. That's about all I can tell. Any help or suggestions are appreciated! PS I've asked Deb Rowden (Thrift Shop Quilts) for help. If she knows the answers, or if I get them from anyone, I'll let you all know. Sorry, I can't help identify it but it sure is pretty. I'm guessing 1930's ..... 40's because of the flour sack fabrics used. 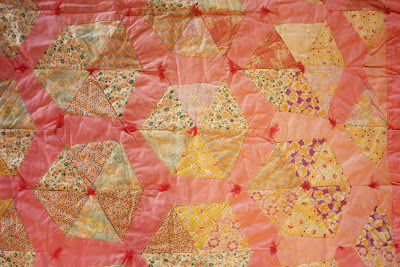 Pretty quilt! Kim: It's so much prettier in person, too. That's something I'm just learning about. I guess by the prints used. I need to do a study project on the flour sacks. Cathy, if you're still on this thread (no pun intended), would you please let us know what you know about flour sacks? Appreciate it. Back in the 30's and 40's ( FYI I wasn't born yet LOL!) The flour came in cloth sacks in brightly colored prints. My Great Grandmother and Grandmother made aprons, dresses, quilts you name it from them. Sometime for fun go Ebay and search flour sack fabric..... people collect them ( the vintage ones). Certain prints sell for big bucks. If you can get your hands on a copy of the book "Dating Fabrics a Color Guide 1800-1960" by Eileen Jahnke Trestain it is excellent. When my Grt. Grandma died my mother found an old suitcase filled with the old flour sack fabrics. I was in grade school then and remember learning to sew with those fabrics. Didn't much care for them then as I wanted new "in style" material. What did I know!! I did a little researching on line after the other postings this morning. One or two of the sites say that in addition to the flour sacks, there was often yardage and (get this) wall paper that was sold in the same patterns. They said that you couldn't identify a flour sack because of a coarser weave, because in those days, there was yardage sold like that off the bolt. I guess you really need to get into this. I think, for my needs, for now I'll just consider that fabrics from that era with those particular types of floral patterns may well be the flour sacks. What the heck. Thanks for telling me about the book. I actually believe it's collecting dust on a shelf around here...now...to find it. It's been a lot of years since I remember seeing it. I wholeheartedly agree about dating and signing....its not too late to put a little label on that quilt with the info that you have.